February is almost here so I've started thinking about valentines! I really love the new CTMH Charlotte paper collection so this year my valentines will be full of love, they just won't be pink! The white shimmer trim provides the sparkle, the stamping is with the Cricut alphabet stamp set, the love cut out is mounted with thin foam tape & don't you just love the gold puffy heart! 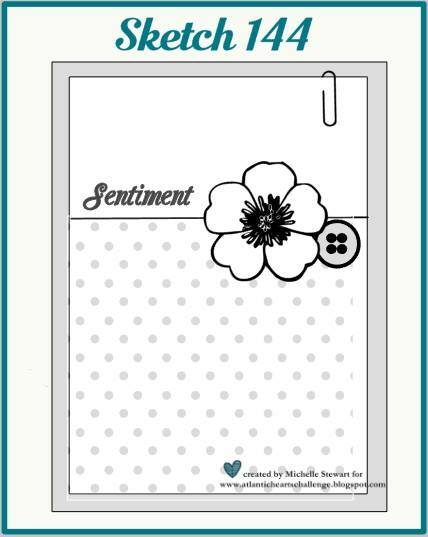 Be sure you visit the Atlantic Heart's Sketch Challenge blog to see all the cool creations this week! A beautiful card, thank you for sharing. What a lovely card. I really like the colors you used for the Valentine's card. Thank you so much for participating this week at Atlantic Hearts Sketch Challenge. Love it all! Great take on the sketch! Thanks for playing along at Atlantic Hearts this week! 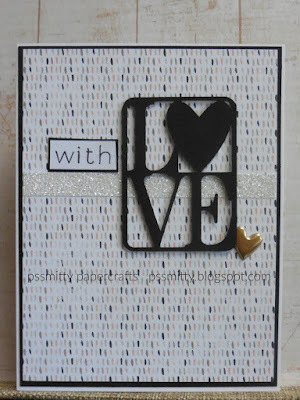 Super cute card, I love the the love die cut! Thanks for playing along with Atlantic Hearts Sketch Challenge (AHSC)! I love the black and white on this card! Thank you for playing with AHSC!!! Oh, this is a gorgeous card with the Charlotte paper, proving that it can be masculine too! Thanks for joining our sketch challenge at AHSC.